SYDNEY, Australia, March 27, 2014 (ENS) – An American zoo is partnering with an Australian university to save the endangered Tasmanian devil in the wild, in the first initiative of its kind. A carnivorous marsupial, the Tasmanian devil faces extinction within 25 years because of devil facial tumor disease, a contagious cancer that has killed 85 percent of Tasmanian devils since 1996. The Tasmanian devil, Sarcophilus harrisii, is the world’s largest carnivorous marsupial. The size of a small dog, it has a stocky, muscular build, black fur, a pungent odor, a loud screech, a keen sense of smell, and is known for its ferocity when feeding. The University of Sydney and San Diego Zoo Global are collaborating to save the rare marsupial through reintroduction and careful management of a disease-free population. 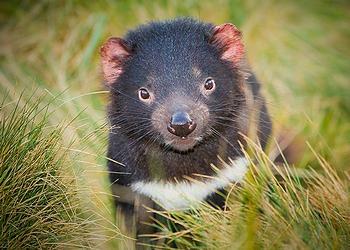 The project will reintroduce 50 devils onto Maria Island off the east coast of the Australian island state of Tasmania. The group will be managed much as they would be in a zoo setting by selecting disease-free individuals and maintaining genetic diversity. “These populations will be managed in a way that maintains all of the genetic diversity of the species away from the disease,” said Kathy Belov, professor of veterinary science at the University of Sydney. “Ultimately, the disease will wipe out devils in the wild, but these newly created disease-free populations will be used to re-populate the wild once it is safe to do so,” she said. 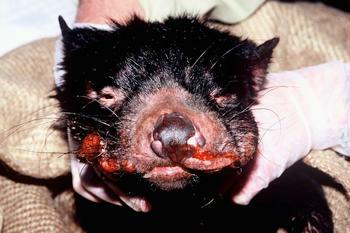 The University of Sydney is known for its leadership in the genetic sequencing of the Tasmanian devil. This expertise will be used to capture a snapshot of genetic variation in the devils being bred in zoos and breeding facilities. San Diego Zoo Global is contributing $500,000 to the project, including funding the employment of conservation geneticist Catherine Grueber at the University of Sydney. Tasmanian devils had low immune gene diversity for hundreds, and possibly thousands, of years before the emergence of devil facial tumor disease, researchers at the University of Sydney and University of Adelaide discovered in 2012. “Devils once lived across much of mainland Australia, but became extinct sometime in the last few thousand years,” said Dr. Jeremy Austin, from the Australian Centre for Ancient DNA at the University of Adelaide. The researchers studied the oldest marsupial genes to have ever had their genetic code sequenced, taken from mainland devil specimens at least 3,000 years old. They found that immune diversity in devils was low in all Tasmanian samples dating from the 1980s back to before European arrival in 1800. Mainland devils, isolated from the Tasmanian population by sea level rises at the end of the last ice age, also had low diversity similar to Tasmanian devils. “Low immune diversity would have made devils susceptible to disease outbreaks. This may explain their history of population extinctions, population crashes and disease outbreaks in the 1800s and early 1900s, said Katrina Morris, then a PhD candidate at the University of Sydney’s Faculty of Veterinary Science and senior author of the DNA study published in the journal “Biology Letters” in December 2012. Devils are found in all habitats on the island of Tasmania, including in the outskirts of urban areas, and inhabit areas throughout the Tasmanian mainland. Devil facial tumor disease causes tumors to form in and around the mouth, interfering with feeding and eventually leading to death by starvation. The decline in devil numbers is also seen as an ecological problem, since its presence in the Tasmanian forest ecosystem is believed to have prevented the establishment of the red fox, illegally introduced to Tasmania around the turn of the 21st century, Associate Professor Robert Beeton of the University of Queensland, chair of the Threatened Species Scientific Committee, wrote in 2010, advising the Tasmanian government to list the devil as endangered. The devil has limited the number of foxes, feral cats and dogs because devils eat carrion that would otherwise feed these creatures, as well as killing adult foxes and young foxes in dens. Foxes are a problematic invasive species in all other Australian states and, if established in Tasmania, they would both hinder the recovery of the Tasmanian devil and prey on many other vertebrate species, Beeton and other scientists say. The population of Tasmanian devils was estimated at 65,000 to 75,000 in the early to mid 1990s. The devil facial tumor disease, habitat destruction and deliberate culling by humans had reduced that population to an estimated 10,000 to 25,000 by 2008, according to Beeton. The Save the Tasmanian Devil Program, a joint initiative of the Tasmanian and Australian governments was established in 2003 to respond to the disease threat. This program coordinates research from institutions around Australia and overseas, including Sydney University, CSIRO, Queensland University and the University of Tasmania. Bringing species back from the brink of extinction is the goal of San Diego Zoo Global, and SDZG was the first overseas zoo to sign a partnership agreement with the Zoo and Aquarium Association and the program. This zoo received four devils no longer required for breeding as part of the insurance oopulation and opened a newly constructed Tasmanian devil exhibit in late October 2013.